Brian Chase of the Normal (Ill.) Public Library expedited checkout with a radio frequency identification deployment. Institutions offer wireless access and PCs to flourish as a place for community engagement. It's a familiar sound in libraries, but not in Cleveland Public Library's TechCentral space. Instead of readers with their heads buried in books, a visitor to TechCentral will find community tables where groups of people can tinker with waterproof cameras, e-readers, global positioning systems, tablet computers and other gadgets on display. It's like walking into an electronics store, but instead of making a purchase, patrons can take home the goods at no charge for up to a week, says TechCentral Manager CJ Lynce. "I get to play with a lot of fun stuff," he says of the TechToyBox gadget display, which is wildly popular with patrons. "We don't have enough devices to meet the demand." 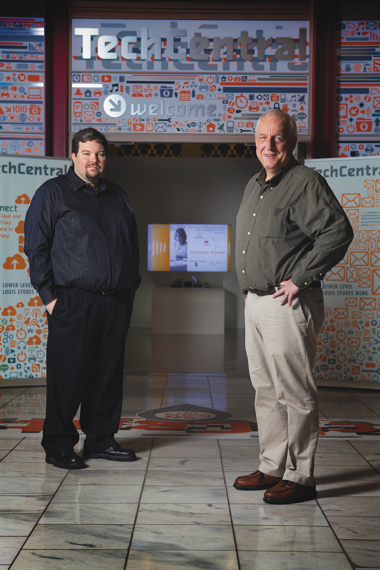 Collaboration thrives in Cleveland Public Library’s TechCentral space, say CJ Lynce and Larry Finnegan. TechToyBox is just one of the projects at the Cleveland Public Library aimed at increasing patrons' access to technology, and the institution is just one of many launching such initiatives. From high-tech demos and library apps to QR codes and radio frequency identification (RFID), libraries around the country are finding new ways to use technology to gain efficiencies, improve customer service and bridge the digital divide in their communities. "The more global the world becomes, the more important it will be for libraries to be places where people can come for information and community dialogue to address issues," says American Library Association President Maureen Sullivan. "Technology will continue to be a key in identifying the library's central role in community engagement." That's certainly true of the Cleveland Public Library, which offers a maker space. "Instead of just consuming access to technology, people can actually use technology to make stuff," explains Lynce. The library has a 3D printer, which patrons have used to design plastic models or print objects they've found online. "We're actually creating an entire chess set out of things we've found on the Internet." TechCentral has sparked more of a collaborative, fun environment at ­Cleveland Public Library's downtown campus, adds Cathy Poilpré, assistant marketing and communications administrator. "It really has added to the energy level," she says. "It's the place to be in the building." Technology professionals staff the collaborative area and interact with the public. "I think when you have people who really get it, it makes a difference," says Larry Finnegan, acting IT director. In 2008, Cathy Sanford of California's Contra Costa County Library just wasn't getting it. The deputy county librarian for support services was participating in a statewide think-tank workshop on the future of library services. The hot topic was quick response (QR) codes, and participants were taking pictures of codes to see how they worked. "For the life of me, I couldn't figure out why this was important," Sanford says. Soon after, Sanford was shopping for a dishwasher and had forgotten to bring her research. She decided to check out a QR code she saw on one of the appliance labels; that link took her to a review. In that instant, she understood the value of QR codes. "I thought, 'I got this,' " she recalls. The library won an innovation grant to launch a program called Snap & Go, which uses QR codes to suggest books that patrons might enjoy based on their reading preferences. The codes are also used to direct teens to a poll about their favorite books and to market events and services. "That was still a big innovator back then," says Sanford. "Nobody was doing anything like that at the time." Before long, book jackets included QR codes with links to extras, such as games and fun information about characters. "Now QR codes are everywhere." The codes have since enabled the library to offer audio books compatible with users' smartphones, provide passes to partner organizations such as museums, and launch a text messaging service in which librarians field questions. "Our goal is to be where our customers are, and they're glued to that phone." "Our goal is to be where our customers are, and they're glued to that phone," says Sanford. Contra Costa County Library hired a software consultant to create the system, but it was the library staff's vision, explains Sanford. The staff hasn't devised measurable ways to determine the project's success, but they do know that mobile use of library services has risen 6 percent, and the use of digital books is up 65 percent, thanks to multiple factors. The project's success was clear early on. "We felt like we met all the goals that we were trying to achieve — fast, easy, convenient, and we were teaching patrons and staff about these technologies," Sanford says. While Contra Costa County Library uses technology to get patrons into the library (physically or virtually), Normal Public Library in Illinois uses it to get them out. NPL began using self-checkout machines years ago, but last fall switched to a radio frequency identification (RFID) self-checkout system after tagging its 190,000-item collection. The library previously had five staffed check-out stations; now there are three plus four self-checkout machines. "Efficiency certainly is a big part of it," says NPL Director Brian Chase. Library officials could have purchased a turnkey system through its RFID vendor, but the staff had some reservations about the hardware. Cost was also an issue, so they decided to build their own system. Chase's group began by contacting its CDW•G representative, who provided an in-house point-of-sale specialist whose expertise was key to the project's success. "They were very helpful," he says. "Asking questions is so important in something like this, because it's easy to overlook a detail." The homegrown system consists of a 22-inch, all-in-one touch-screen computer; barcode reader; credit card swipe machine; RFID antenna; and receipt printers. "We definitely feel that we got superior hardware at a lower cost," says Chase. "It was tricky, but worth it." Staff tested the system and in November made one of the four RFID stations available to the public. The library recently put three more into service after adjusting as needed and letting the public acclimate to the technology, Chase says. "We see RFID technology as a way to effectively and efficiently circulate, identify and secure our materials," says Chase. "Tagging the collection and deploying the RFID staff stations and the self-checks represent the first two phases of the transition. Potential next phases include an inventory wand to better inventory our collection, and an automated sorter to check in returned items." Deployment challenges were minimal, says Technology Manager Enoch ­Kindseth. Some patrons received error messages and couldn't figure out why, so the staff would explain that items were on hold or had already been checked out. Others tried to scan items instead of just placing them on the pad. "Things like that are just a learning curve for patrons and staff," Kindseth adds. Most people are familiar with barcodes, so RFID can be a little confusing at first, but many — especially kids — think it's really interesting when they see how it works, says Chase. He thinks RFID self-service will be the norm in libraries before long. "It's definitely a technology that will benefit libraries for years to come." Libraries have played an ever-­expanding role in providing technology access to all citizens. Between 1996 and 2012, the number of libraries offering public access to the Internet has swelled from 28 to 95 percent, according to the American Library ­Association. That mandate, however, is challenging, considering the tightening budgets at libraries around the country. Many, however, can get help meeting their technology goals thanks to E-rate. The federal program, admin­istered by the ­Universal Service ­Administrative Co., offers discounts on telecommunications and information tools and services, such as Internet access, wiring and hardware. It has provided more than $350 million in discounts since 1998, according to ALA. The discounts, which range from 20 to 90 percent, are based on the library's finan­cial situation and need. For information on how to apply for E-rate discounts, visit universalservice.org/sl. A salesman relied on the Cleveland Public Library computers to keep track of his accounts. But each time he logged out, all the work he had done that day — typing customer lists, preparing mailings — was wiped clean, and he'd have to start from scratch on his next visit. The library offers computers to help close the digital divide within its community. "The bridge was out," says Acting IT Director Larry Finnegan. A big step toward solving the problem was to provide patrons with devices on which to save their work. Cleveland Public Library created the MyCloud service, which offers users access to mobile HP thin clients to create accounts and save their work. The library has 120 thin clients spread throughout its 28 branches. It plans to expand to 600 by February and deploy MyCloud to CLEVNET, a consortium of cooperative libraries in 11 counties of northeast Ohio. The salesman can now save his client list and pick up where he left off each day. "Imagine the time it will save him," says Finnegan.